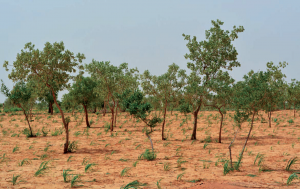 The 2nd Regional Forum of the African Initiative for Combating Desertification to Strengthen Resilience to Climate Change in the Sahel and the Horn of Africa (AI-CD) was held from 28th to 30th August 2018 in Dakar, Senegal. Around 50 participants from seven countries in the Sahel Region attended (i.e., Burkina Faso, Cameroon, Chad, Mauritania, Niger, Nigeria, and Senegal) along with representatives of international agencies, namely: Japan International Cooperation Agency (JICA), International Center for Agricultural Research in the Dry Areas (ICARDA), Global Environment Facility (GEF), Food and Agriculture Organization (FAO), Executive Secretary of the Permanent Inter-State Committee for Drought Control in the Sahel (CILSS), and the Executive Secretariat of the National Food Security Council (SECNSA). 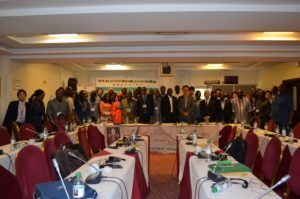 In March 2017, the Sahel Regional Kick-Off Meeting was held in Senegal to introduce AI-CD to stakeholders, discuss its Terms of Reference (TOR), and facilitate the development of action plans for each participating country and partner organisation. After 1 year and 5 months from the afore-cited kick-off meeting, the 2nd Sahel Regional Forum was conducted aiming to (1) share AI-CD’s progress and the relevant efforts of each country and partner to prevent desertification, (2) discuss the framework for knowledge sharing in the Sahel Region, and (3) seek ways to access financing to further concretise the action plans. The seven (7) participating countries shared the progress of their activities based on the respective action plans. 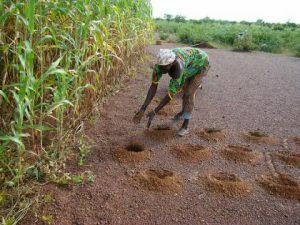 While a few of them have been promoting activities against desertification with unwavering support from political leaders, most of these countries have to address the challenges in financing implementation efforts, in particular the necessity to access international funding and strengthen financial sources with private sector’s support. 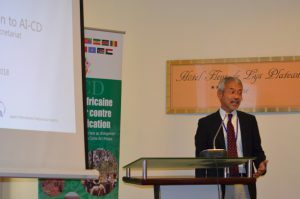 The Global Environment Department of JICA, which serves as AI-CD Secretariat, introduced the “In-Country AI-CD Promotion Workshop Support Programme.” In the Horn of Africa Region, South Sudan adopted this programme and held a workshop to discuss ways to promote actions against desertification to participants from various organisations in the country . Countries in the Sahel Region are also expected to use the programme and make further progress in their action plans. After the discussion of said programme, partner organisations such as JICA, CILSS, FAO, GEF, and ICARDA shared their efforts to support AI-CD countries. CILSS introduced its ongoing programme and platform to promote knowledge sharing. The AI-CD Secretariat also introduced its communication tools  (e. g., website, Facebook, Twitter, and YouTube) and presented the possibility to use these for knowledge sharing in the Sahel Region. 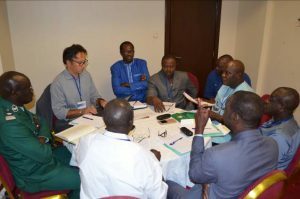 Based on these introductory discussions, the participants set the framework to promote knowledge sharing under AI-CD in the Sahel Region. Other related topics were also tackled, such as methodologies or approaches to document good practices, effective ways to deliver information to grass-root stakeholders (e. g., through radio, TV, and community meetings), and the importance of adopting the strategy to transfer properly useful techniques to grass-root stakeholders. The seven (7) participating countries presented in a contest their respective good practices to combat desertification. 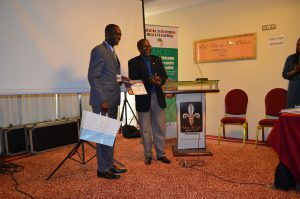 Chosen for the first prize, as judged by partner organisations of AI-CD, was Niger’s “Assisted Natural Regeneration（ANR)” while Burkina Faso’s “Zai” won the 2nd prize. AI-CD Secretariat introduced the general information about funding sources (e.g., GEF, FAO, Global Climate Fund or GCF) and current trends of the country strategies of World Bank and African Development Bank. In addition, Japanese technologies and products/services of small- and medium-enterprises which can contribute in addressing the desertification issue were presented. Cited also were corporate social responsibility (CSR) activities by Japanese companies which can be tapped to augment desertification initiatives’ financial requirements. As concluding activity, a panel discussion was conducted led by the AI-CD Secretariat and experts from GEF, CILSS, and SOS Sahel (a French NGO).